Stripes is a Texture Painting application for the Ptex file format. Stripes can open, paint and save Ptex files, and it provides a multi-layer painting support that takes full advantage of Ptex. For example, a new layer can be created just for a few Ptex patches. Stripes is the code name of a suite of plug-ins and applications developed to add Ptex support in 3dsmax and soon in Maya. Ptex Shaders is a set of plug-ins and shaders for 3ds Max, Maya and mental ray that provide rendering support of Ptex files in 3ds Max and Maya. The Ptex suite for 3ds Max includes a modifier that applies automatic UVs to a PolyMesh object, and a texture plug-in that can render Ptex files. It also includes a mental ray shader for support of Ptex files in mental ray. The Ptex suite for Maya includes a node that applies automatic UVs to a PolyMesh object, and a texture/2d node that can render Ptex files. It also includes a mental ray shader for support of Ptex files in mental ray. 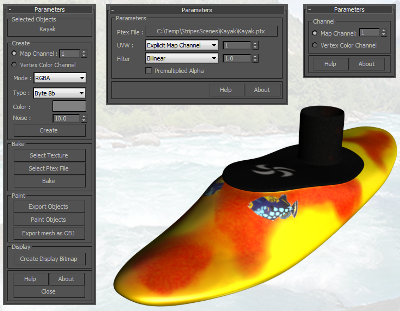 Ptex Tools is a 3ds Max utility that creates Ptex files, bakes 3ds Max textures into an existing Ptex file, and exports objects with Ptex textures in a 3D format that Stripes can read.